How do you define an it-girl? Do they have to be famous on social media, or only known and/or envied by important people in ~the industry~ (fashion, movie, T.V., etcetera)? Or do they just have to look really really cool without even trying? Effortlessly cool, right? My former self thought you had to have all the big designers' products to be deemed an it-girl -- that Alexander McQueen bomber or the latest Calvin Klein overalls or cropped flares from Citizens of Humanity. But my former self was oblivious, even though I still really want those cropped flares. Money doesn't buy you that cool factor; going an extra step with your look, the more unique the better, does. After this revelation, I wiped the stress-sweat off my forehead while looking at the extremely low number listed on my bank account because I already had what I needed. I learned a few weeks ago that there are more things than turtlenecks that can protect your neck. 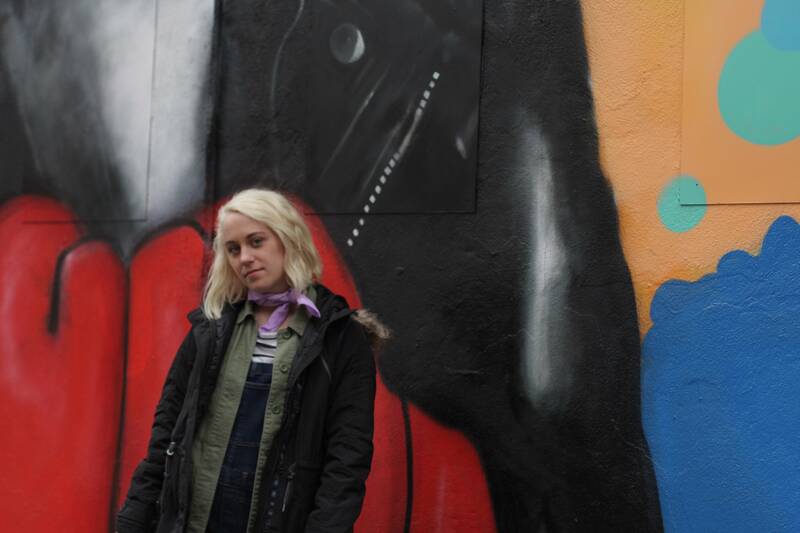 I took a lavender bandana, tied it around my neck, bow in front Parisian-style, and didn't freeze to death in that chilly NYC weather. I now tackle the bandana again, but it wasn't cold (it was actually surprisingly warm for a late-February day) and it was hardly Parisian. 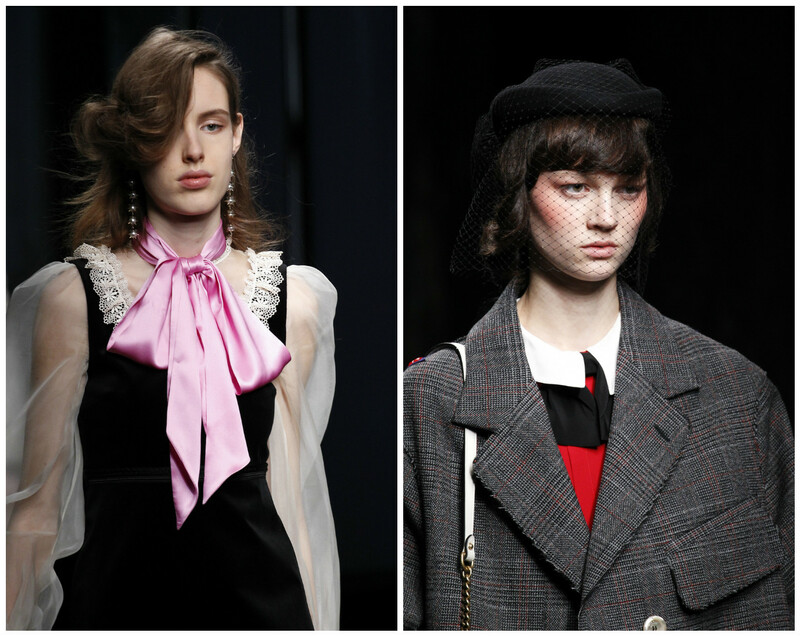 Bows are great and all, as Gucci believes, but sometimes you have to change things up, do it differently than the rest, because that's a requirement for all it-girls. 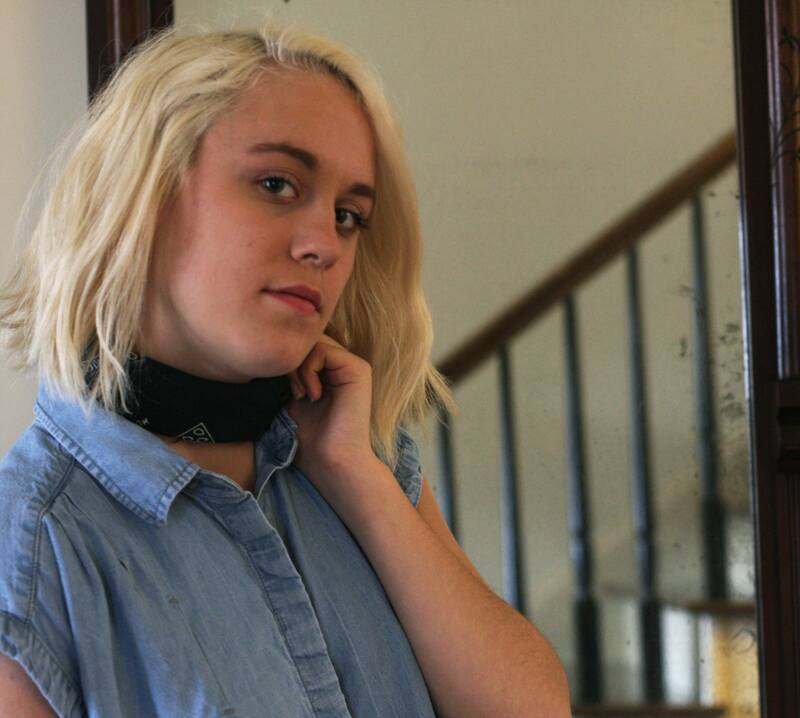 I tied the bandana around my neck choker-style, just like before (now it's black), but then I tucked in the ends and shifted the knot to the back of my neck, and voila: Parisian neck-scarf turns into cool-girl choker. Wearing this simple denim dress from Urban Outfitters alone would be "girl-next-door is trying to be stylish but it's kind of boring", but adding the simplest of items that everyone must have from the days they used to wear bandanas as hair accessories makes a look that is the complete opposite of girl next door, it's girl everyone wants to be. Now is that the definition of an it-girl? Here's the beauty of it all: it's the simplicity of the accessory combined with the unconventionality of the use of said accessory. Effortlessly cool, basically. 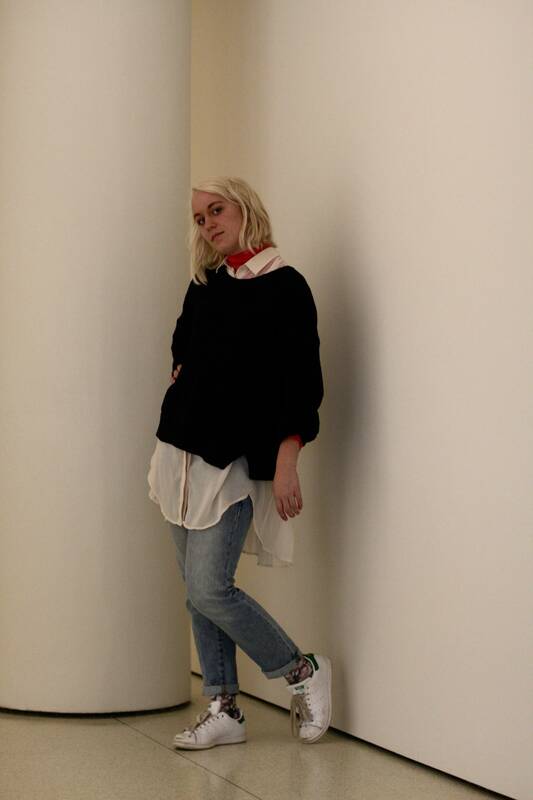 Tie the same bandana around your wrist a few times for a new take on bracelets, or even tie it around your ankle with ankle boots and cropped flares (there's cheaper ones than those Citizens of Humanity ones, like these). Adding an extra oomph of cool to an outfit, no matter how easy it may be, is the instant recipe for it-girl. I don't guarantee that a bandana will turn you into someone the entire Internet loves overnight, but it'll at least make you look like one. And this is something I noticed in New York a few weeks ago -- the people who stood out in terms of fashion had the simplest of accessories added to a fairly undemanding outfit. Not a conventional necklace or pair of sunglasses, but a really cool hat (it was cold!) or a few pins attached to an embroidered bomber. Once again, it's that simple. Who said looking cool had to be difficult? Dress by Urban Outfitters. Shoes by Adidas. 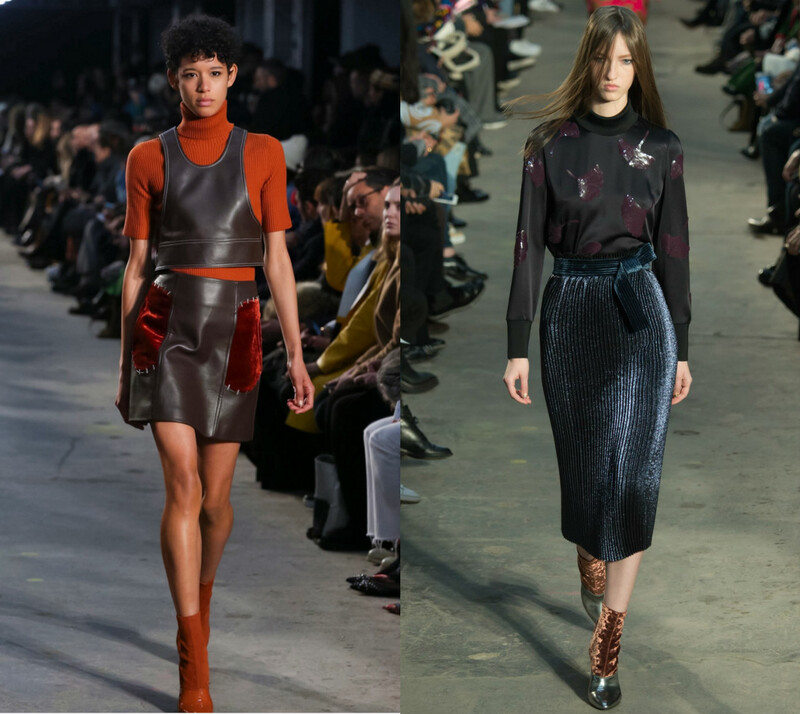 Fashion week isn't necessarily a competition, but if you think about it, it could be, and maybe it should be. An immense amount of excellent reviews for a show is equivalent to the first place prize, correct? If this were true, then it's an obvious answer as to who won that award -- Alessandro Michele. He's a name everyone should know by now, a.k.a. the new creative director of Gucci, the luxury brand that fits the definition of Italian high fashion. Michele has been the head designer for the brand for only a little over a year, but everyone, and I mean everyone, feels his strong influence over how he sustained the brand of Gucci but also created this new and brilliant, look for himself as a designer. He should be on everyone's top 10 list. He's definitely on mine, ever since his breathtaking SS16 show for Gucci last year. There comes a rare moment in fashion month when the unbelievable happens, when everything falls into place, when a show gets 11 out of 10 stars, a 110%, a better than perfect. And for the past two seasons, Michele has been able to achieve this rare fashion moment, the moment all designers hope to attain. With Gucci, it's hard to find the mistakes. That's a designer's cue to know they've made it. Michele introduces this collection of an impressive 70 looks that is a combination of probably a dozen different inspirations and styles. 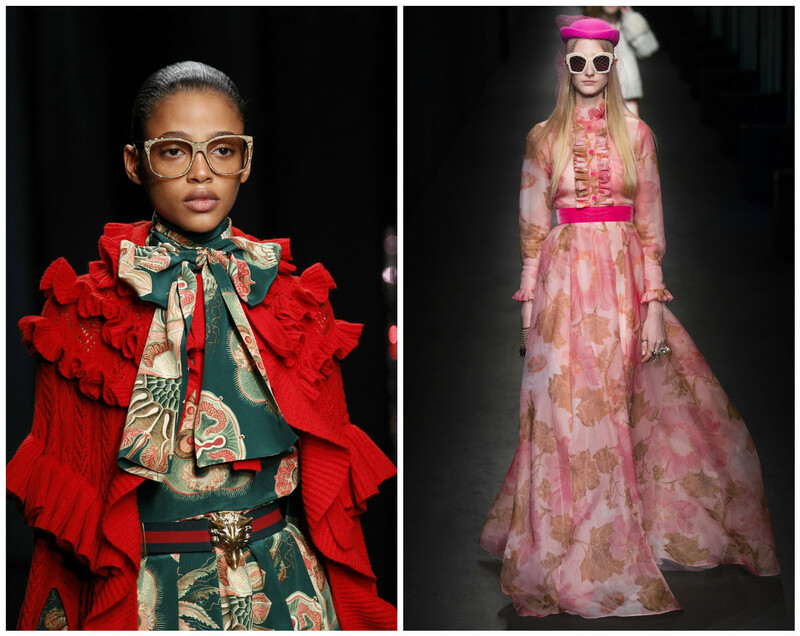 A dose of Italian Renaissance, as always, with a hint of '70s glam, Catherine de' Medici, vintage wallpaper-inspired prints, geek-chic glasses, and a touch of what Michele does best -- over accessorize. Oh, also add the fact that a New York street artist by the name of Trouble Andrew added a 2016 twist with graffiti-inspired designs to contrast with that vintage feel, because Michele's pieces have to have that it-factor, even if they already had it from the beginning of the planning period. Also, casting my favorite photographer/it-girl Petra Collins (who, I have discovered, is the epitome of a Gucci girl) as a model for the show may be the final detail to make the show a perfect 10. Alessandro Michele's pathway to winning is a complex explanation, but it starts here: pair basic pleated midis with either really sophisticated tops, pearls and sequined bow included, or a basic tee and a bleached denim bomber (don't forget the fur-cuffs). But go overboard with the prints, no matter what. Also, tube socks with strappy heels can make or break your outfit, but I lean more towards the making option (and I think Michele did too). 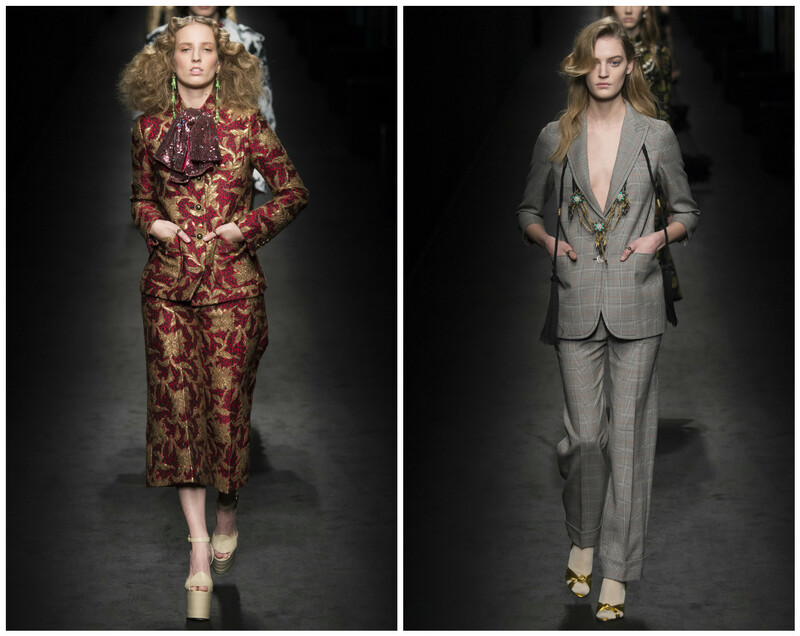 Gucci thinks pantsuits are back in, so maybe working that Dana Scully look can actually be a thing again. Michele was able to make the most feminine and sophisticated one with a red and gold brocade print with a sequined bow and '70s-esque platforms, but he also says that masculine ones with a duller plaid pattern are okay too, just add at least one accessory, no matter how subtle, or the look will fail. 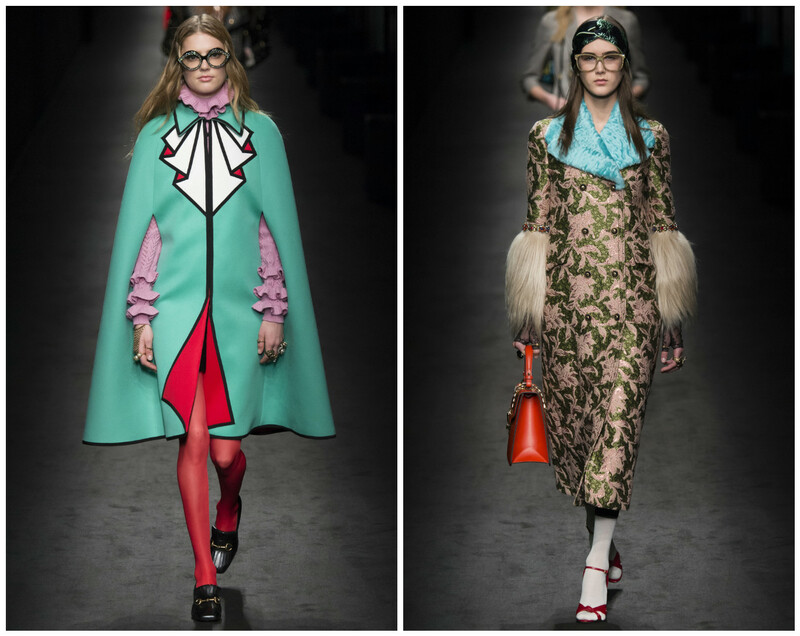 That's what I love about this collection -- there are completely contrasting looks that fall on the opposite side of the spectrum, but Gucci is still able to make it all work together as a whole. I think only fashion geniuses can pull that stunt off. 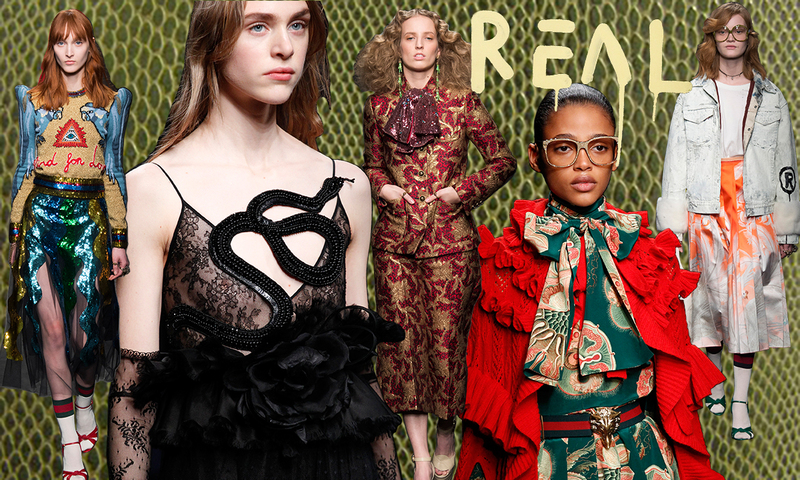 Snakeskin textures may be in, but Alessandro Michele says that actual snakes should be in, so he created several looks that were snake-centric with the slithering creature creating unique lines and shapes for his garments. He made a classic silk pleated dress vicious by adding a unique embroidery of a few snakes, or he continued the racy style of a black lace gown with a sequined snake sliding across the chest. Maybe if Michele was even more bold, he could have had real snakes crawling across the runway. I would assume most are glad that he stuck with just the clothes. Sequins are nice, but sequins over a black sheer fabric is even nicer, especially when they abstractly resemble snakes (Gucci should just trademark snakes already). 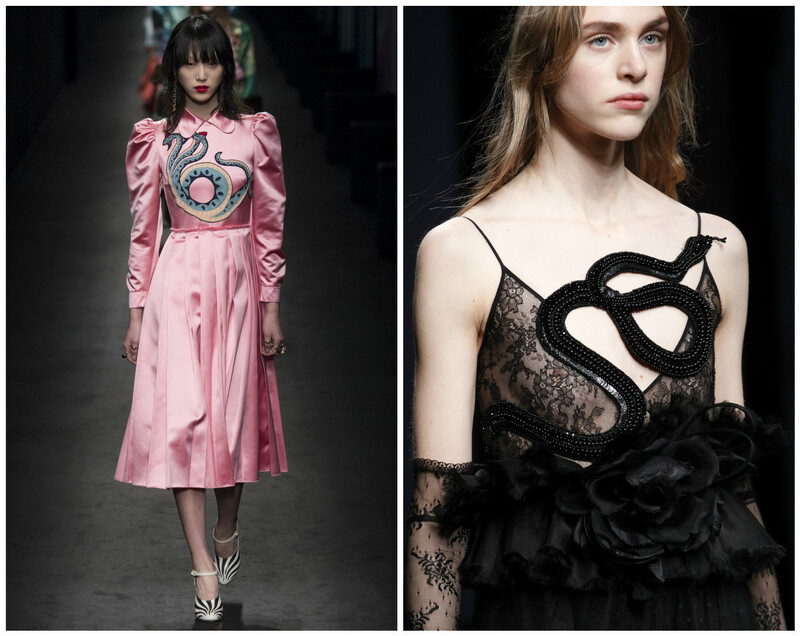 It can be made into a gown with puffy sleeves, or a midi skirt to be paired with a wild sweater filled with embroidered parrots and the illuminati sign. Is this the beginning of a conspiracy created by Alessandro Michele himself? 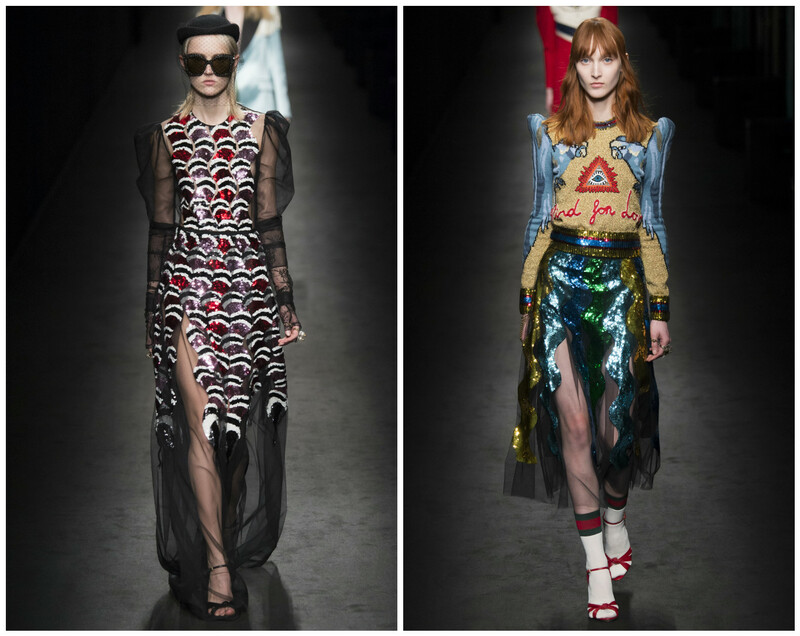 Prints are everything to Gucci (and so are colors and details), so Michele took the print idea to the next level by putting a collage of cherubs on a skirt (and strapless dress) to connect to his Italian roots. Who knew creepy paintings of babies from the 16th century could look so good on a person? The designer is even able to double print -- a Leonardo Davinci esque sun (face included) on top of a print that looks like it came straight from an Italian church. The most innovative part about his prints is that Michele really plays with color when it comes to them -- he washes out the babies with a deep red (does this make it even more creepy? 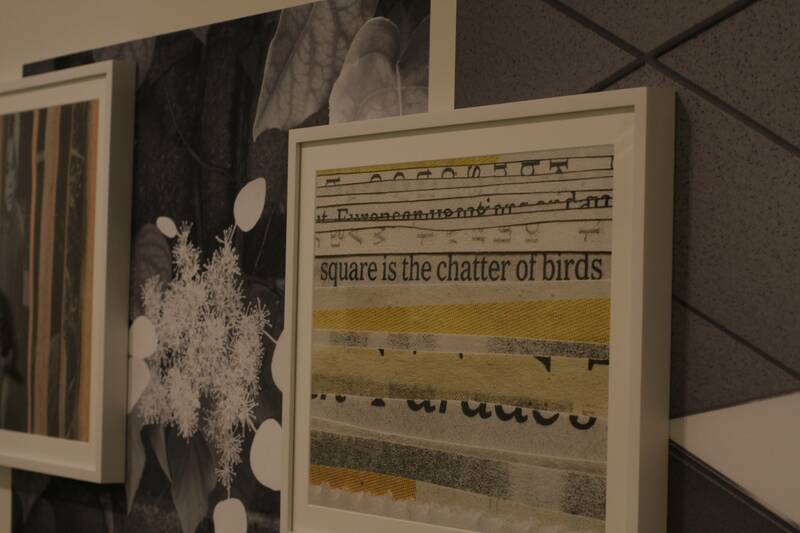 ), and he transfers a traditional print to a modern one with a bright turquoise. Gucci may be the reason why I'll become a fan of bright colors. One of the reasons why Gucci feels so new this season is that Michele takes traditional pieces and adds a touch of his magic to create masterpieces. A cape is nothing new, but adding a graphic pattern to resemble folds and ruffles is. A jacquard coat is nothing we've never seen before, but a shin-length one that acts as a dress with shaggy fur cuffs may just be. This is what makes Michele a brilliant designer -- he's never satisfied with simple or the already-seen; he needs to have an extra level of fascination that makes his collections truly beautiful. 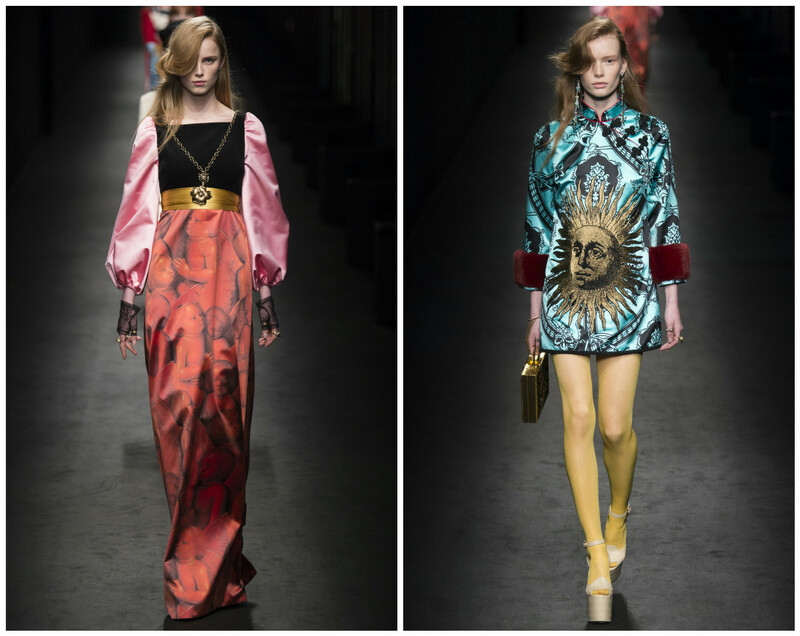 Movement seemed to be a recurring motif in Gucci's show, and Michele did not stick with simple versions. He used light fabrics or heavy ruffled ones to create pieces that flew across the stage, whether it was a cape across an ankle-grazing dress, huge bow included, or an elegant, long-sleeved floral gown. Michele also used unique prints to help those garments soar on their own, but these prints are nothing new. We've seen them in past collections, but they just seem to be getting bigger and better. And we may think by now that it's gotta be the prints that made the show, or maybe the diversity of styles made it a truly special one. But in the end, I think it's due to the details, the small things Michele does that make great pieces excellent and out-there. 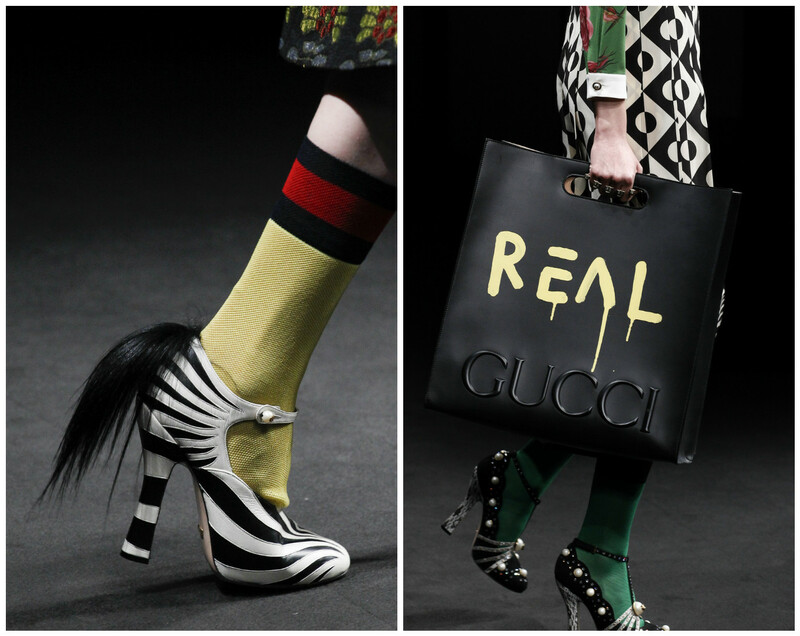 Simply adding a puff of fur to a zebra-striped heel turns classic into idiosyncratic, adding a graffiti-styled "REAL" to a bag with an embossed Gucci logo creates a contrast of styles and a statement that most are not able to pull off. The use of huge bows in varying colors makes Michele's collection an individualistic one, and the juxtaposition of a funeral-themed mesh veil and oversized men's overcoat can produce noteworthy pieces that stand out to every fashion lover out there. I feel like the only way to describe Gucci's collection is to use fancy literary words like juxtaposition and idiosyncratic, and using these words is a compliment to the designer because it means he cares about so much more than the clothes. Fashion is never just fashion, as Alexander Wang probably believes, and Michele follows this rule by, well, making up his own rules. And that is what creates this innovative feel we all see in Gucci's pieces -- structure or fashion-rules are not put into consideration, only bold statements and beautiful looks, rule-following or not, are. Alessandro Michele is not some one-hit-wonder designer we'll forget about in a year, or even one we get intimidated by -- he's warm, as Vogue weirdly describes him, because he does his thing without trying to appear above other designers. His "thing" sure is working, though, and maybe the warmness is why we're immediately attracted to his collections, or maybe just because they're damn good. Alessandro, would you like me to mail or personally deliver your first place trophy? Who do you think should have gotten that theoretical first place prize, if you strangely disagree with my winner? From left to right: Alexander Mcqueen, Burberry, Topshop Unique, Erdem, and Peter Pilotto. 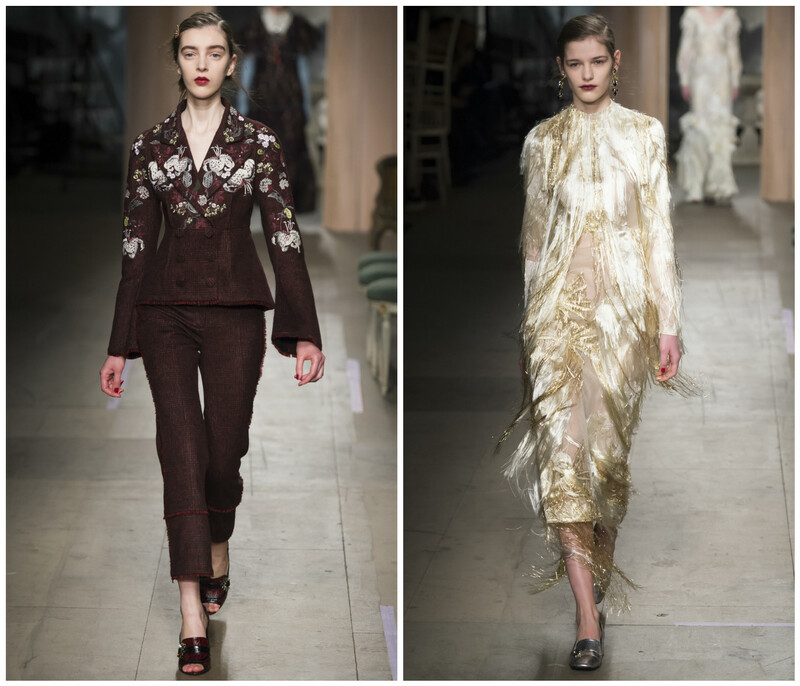 The designer, Erdem Moralioglu, doesn't only take inspiration from one decade, but instead uses three -- the '20s, '30s, and '40s -- for his collection for Erdem. He uses delicate floral prints, embroidery, and vintage shapes to create a collection that is not only a tribute to the past, but a tribute to the stardom from the past. Moralioglu says he always needs characters to inspire him, so in this one, he used old-time stars like Gertrude Lawrence and Bette Davis to drive his inspiration. The source shows in his looks -- each dress looks fit for a star who spews femininity, and even the pantsuit has a feminine touch with the floral embroidery. The designer also brings back the floral frock on a good note, which also tells us that wearing a spring-centric print in the winter is completely okay (plus, he's not the first one to bring up floral patterns this fashion month). Similar to brands like Valentino or Gucci, this collection is simply beautiful in the most glamorous way possible. If only I could wear that flapper-esque dress in the top right photo to prom. 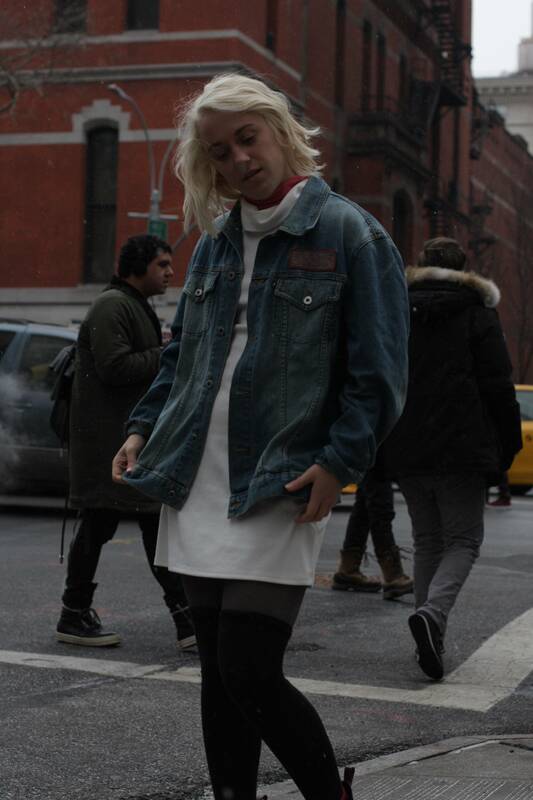 Now I move onto a brand I love with all my heart, the only brand that I actually own clothing from, the first show I ever did a real review on (even if it sucked). Topshop Unique rose from the dust that is called their last disappointing collection from SS16 and returned to show that they're back, and better than ever. A part of my soul lives in their AW15 collection, so it may be impossible to love anything more than that one, but their newest one still deserves a standing O. Long silhouettes (this is starting to get repetitive), reliable outerwear, and statement pieces made the collection one that, in my opinion, defines who Topshop Unique is as a brand. What I love about Topshop is that they always make extremely wearable collections, and this one may be the most fitting. I would gladly wear every single item above, especially that sequined midi, and it wouldn't necessarily be considered "high fashion", it would just be considered well-dressed. 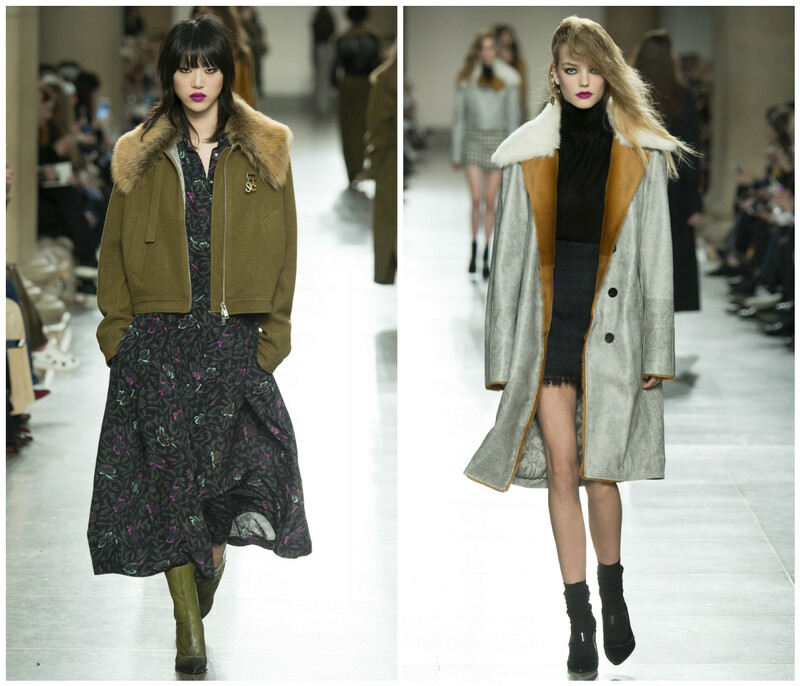 Topshop appealed to the masses, or maybe just the cool-girls, with these looks -- who doesn't love a crushed-velvet ankle boot and herringbone pea-coat? However, they still made it their own with unique items like ribbon-chokers (Adam Selman, anyone?) and '70s inspired velvet dresses. And that's who Topshop is: a brand that is able to both relate to what consumers want, but also create completely unprecedented collections. A paradox, right? 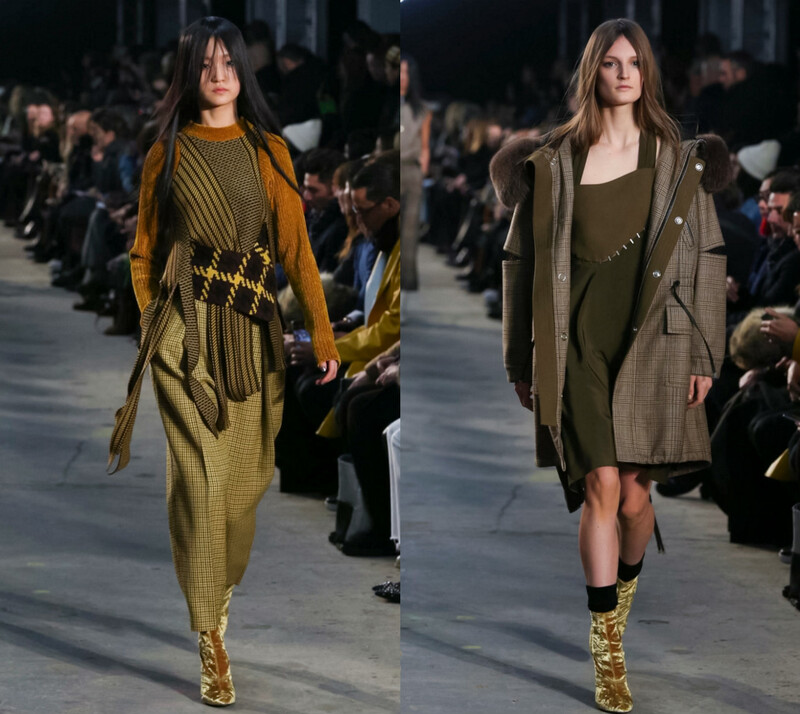 I could go on about my spiel about how there's always comfort in the expected, or I could just bring up Alexander Wang, a designer who we always expect gritty collections from, but that doesn't decrease the overall greatness of them. The next brand happens to follow that same pathway (change gritty to dreamy), and it shares the same first name as Wang. 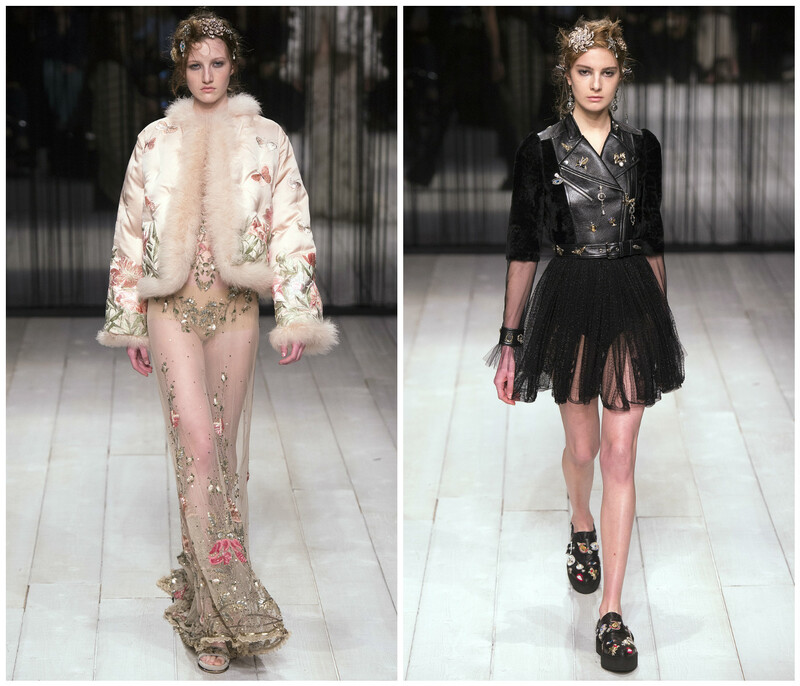 You guessed it -- Alexander McQueen -- now designed by Sarah Burton (female designers REPRESENT! ), who never fails to bring a beautiful collection to the runway when the time comes. It's awfully similar to last season's -- we get that same romantic feel with some ruffles and lots of surrealism in this year's, but Burton still brings a new idea to the table. This season it's embroidery, a tribute to nature, and dream-like gowns that graze the floor and leave little to the imagination. The delicate floral hairpieces and intricate details in every piece showcase the work Burton put into this collection. 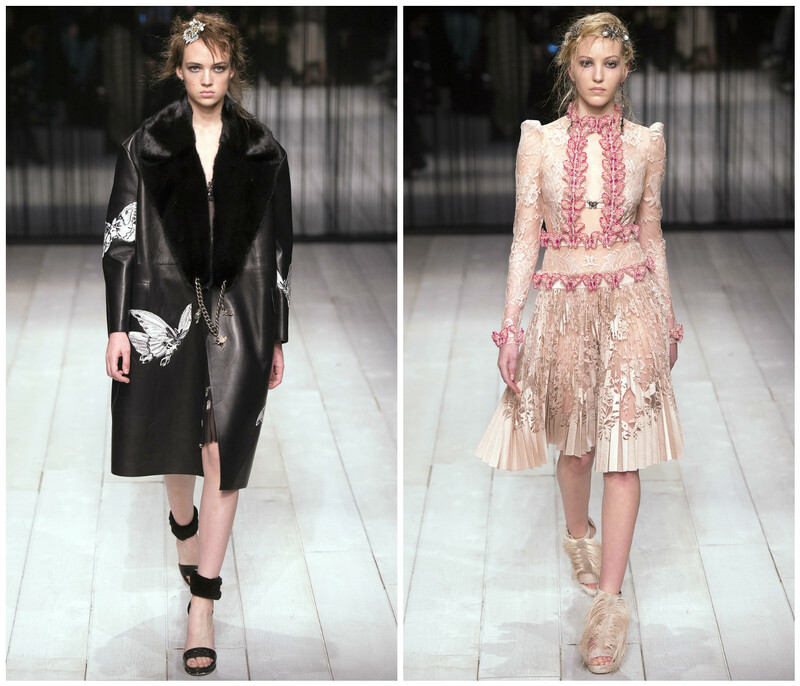 Maybe the fact that a female is designing the collection truly represents the beauty of feminine details and shapes, and Sarah Burton is finally living up to the wonder that is Alexander McQueen. Like poetry, like a dream come true, like a walk through the gardens in The Palace of Versailles, McQueen's collection is one close to a fairytale. 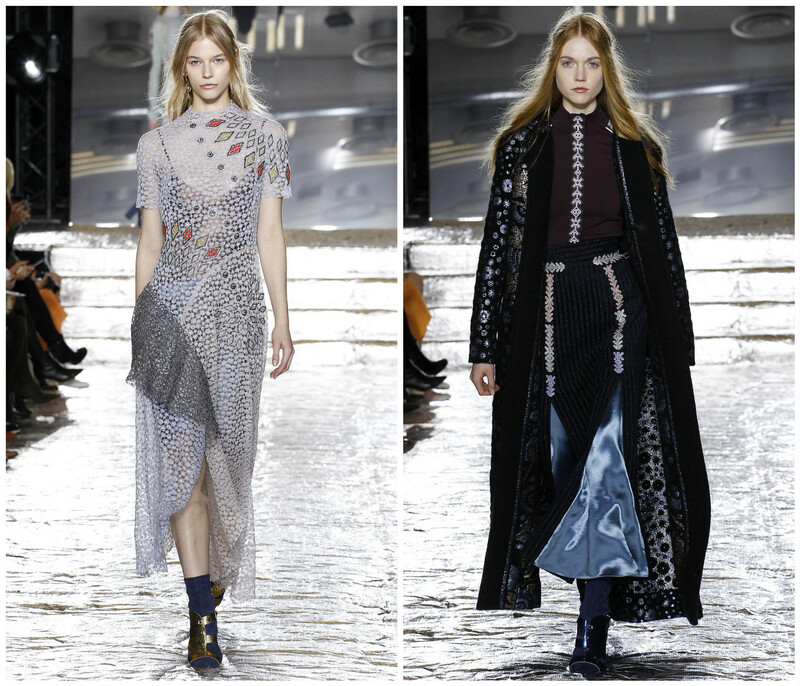 I end my "Best of LFW" with a classic, a brand that defines London fashion as a whole. 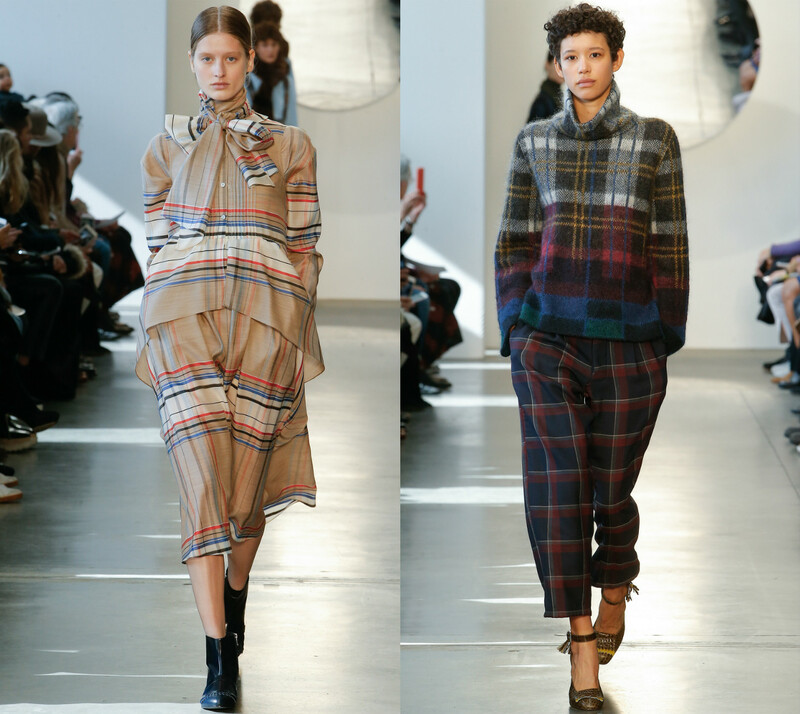 Burberry, of course, and this time it's taking us back to their roots, but with a modern spin. 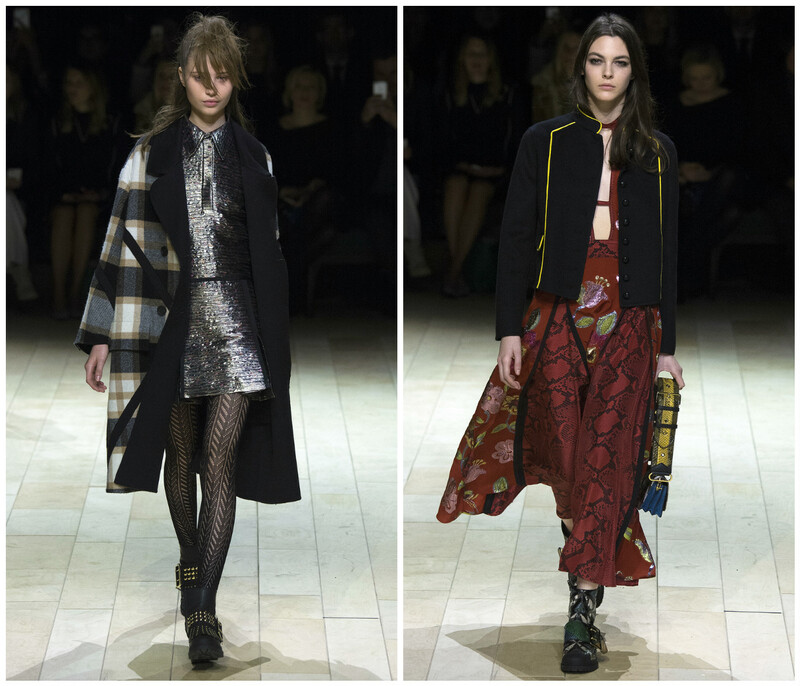 If a glam rocker-girl had to have a trusty pea-coat and sophisticated basics, then she'd come running to Burberry's AW16 collection, textured tights and all. 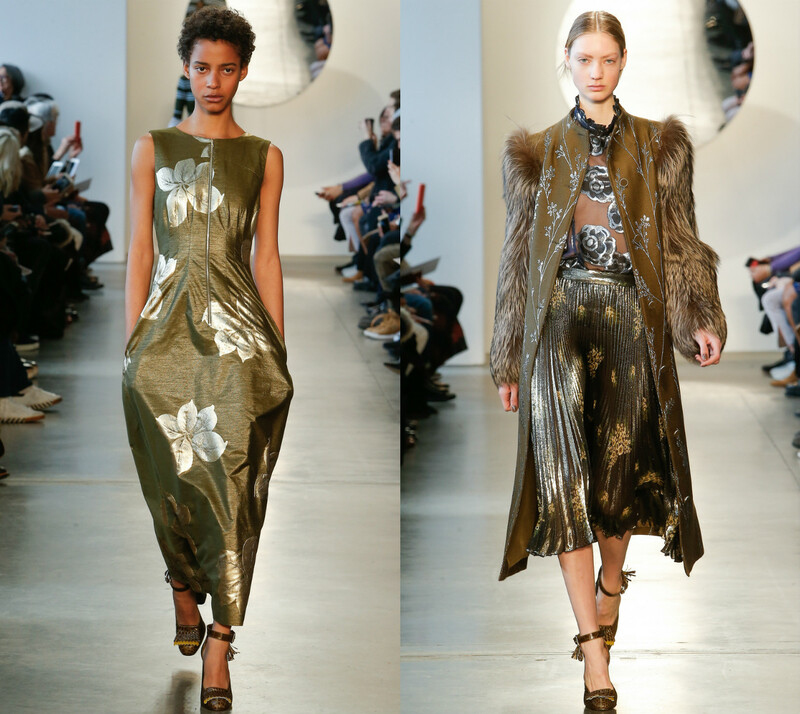 We see the classic Burberry in the boxy tailoring of coats, hemlines of dresses, and traditional collars, but then the Bowie, or better yet, Ziggy Stardust inspired twist comes -- wild, metallic textures and prints that include sequined flowers, snakeskin patterns, and lots of color-infused jacquard. The glitter on the model's cheeks completed the glam feel, yet none of the out-there details of the looks took away from the collection as a whole. Some dresses had major length and volume, but most of the collection fit a structured, mid-thigh hemline, giving room for the glamorous coats to steal the show. The addition of Jake Bugg in the middle of the runway singing his most mellow songs with only his voice and acoustic guitar allowed the models to calmly glide across the runway, and it also did not overpower the metallic prints, which I believe made the show the best out of LFW (or even all of fashion month). 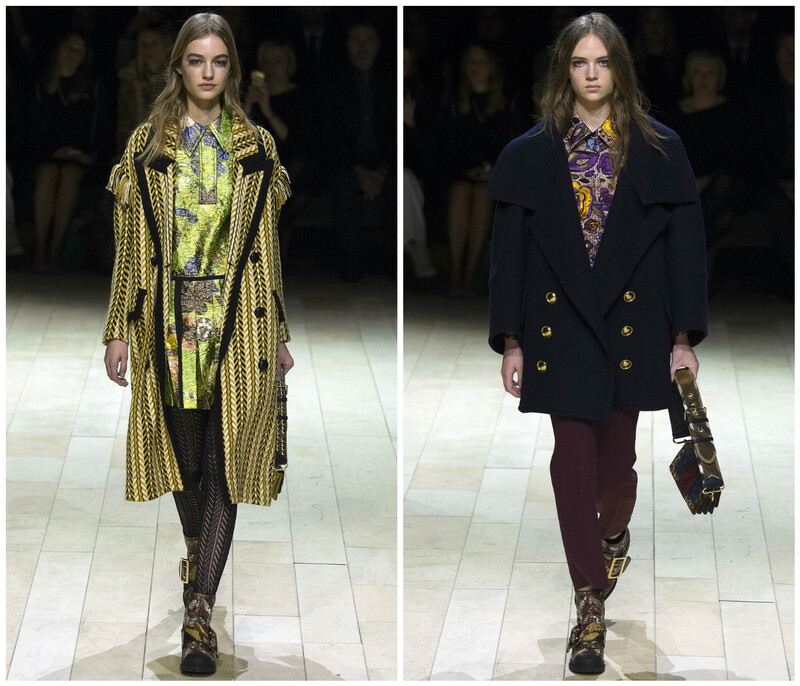 Burberry shows off its traditional London feel by giving looks only fit for a cool-girl from London, and if this is what those girls are wearing, sign me up, please. Milan Fashion Week, I dare you to beat both NYFW and LFW. I mean, the Gucci show tomorrow will probably beat all of fashion month, so MFW will probably win. Again. 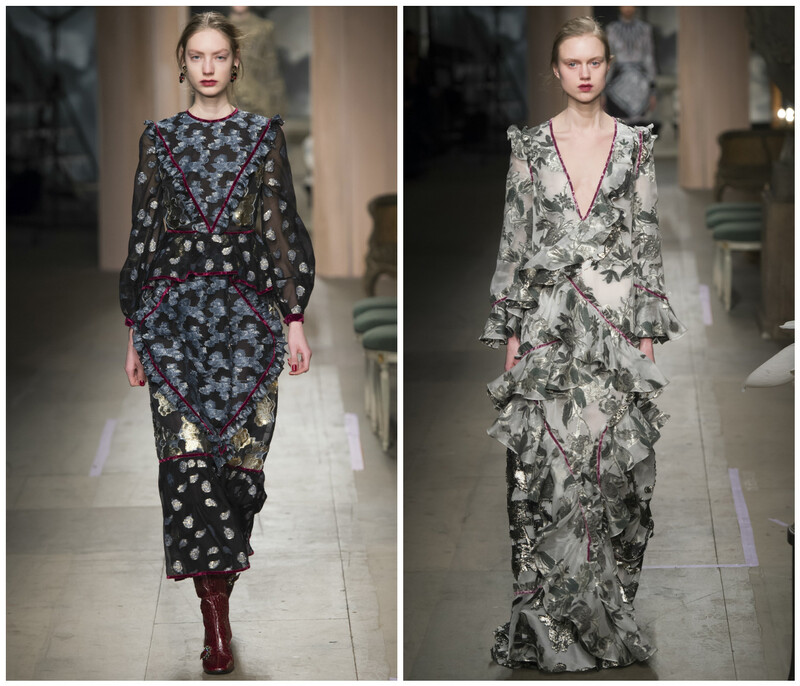 What were your favorite shows from LFW? Share in the comments below! I thought to myself on Thursday night, after the Marc Jacobs show, that the most wonderful time of the year was over, but then I realized -- wait, there's still three more weeks left of fashion month. Even if this is true, there's some type of magic that comes with New York Fashion Week, whether that it's the first week to start the season, or maybe that the freezing weather corresponded with the fitting cold-weather collections from the shows (or maybe they didn't correspond at all, see Alexander Wang). Nonetheless, I've never kept up with a fashion week as much as I did with this one, and I loved all of it. 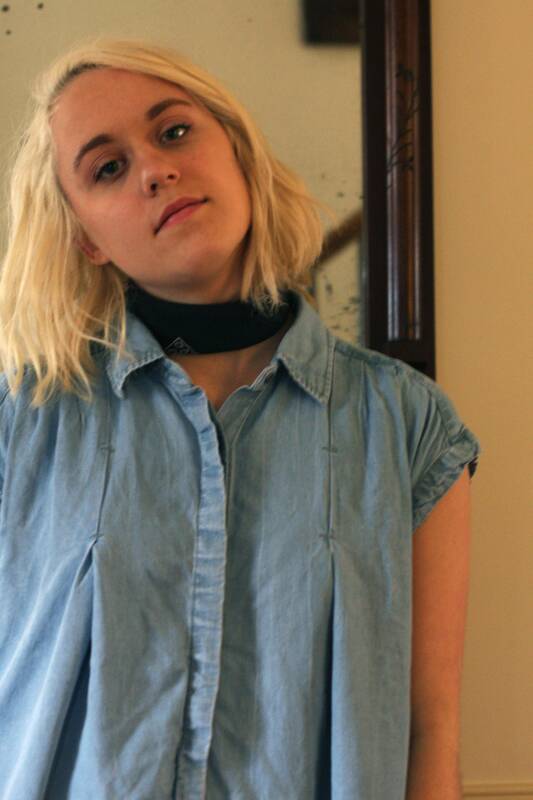 If the future consists of an '80s revival, Opening Ceremony would be designing the clothes. The mention of that decade may make people cringe, but this collection took the good from the '80s and gave it a modern, or an even further in time, twist. When I said "out-there" in the beginning of this post, I literally meant out-there, like, out-of-this-world, extraterrestrial, etcetera. I wouldn't be shocked if these models were aliens that looked like humans or just really well-developed robots. The use of shimmery fabrics (is that spandex? 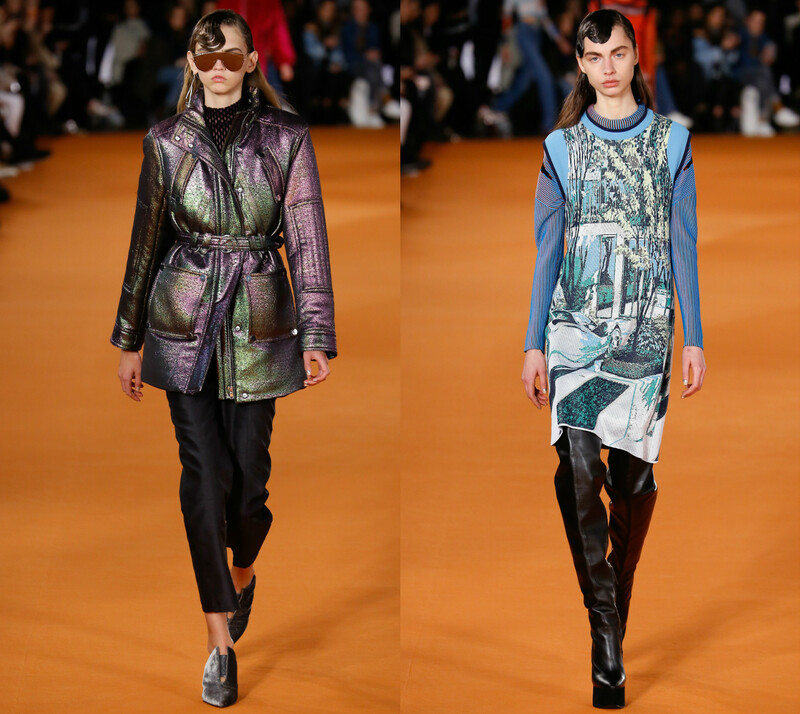 ), retro sunglasses, the occasional futuristic print, and even the '80s-esque techno music gave this collection a 2165 feel (150 years in the future). Part of me thinks that I love this collection because of the risks they took, and Opening Ceremony has always been known for risks (ballerinas as models? Now that's innovative). But the other part may just be a fan of holographic jackets and silver spandex shirt-pant sets. There's always comfort in the expected, and this is especially relevant in designers and expecting what to see in their next collection based on previous ones. 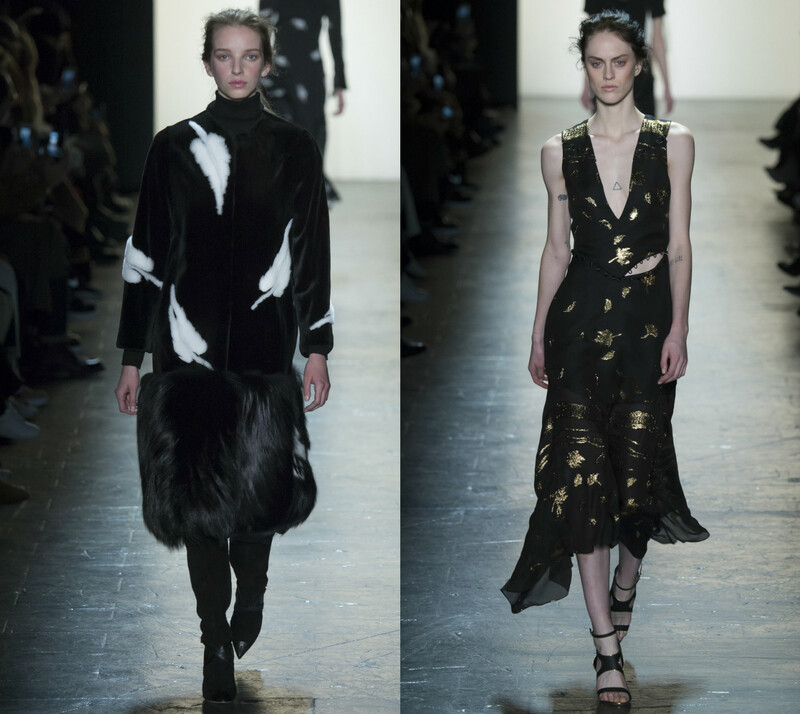 Alexander Wang, which I am now proclaiming as my favorite NYFW designer, brings his same expected style -- edgy grunge, with a touch of the gritty and bold Wang signature. Just like last season's collection, he innovated a new style from the old, and this time it's the grunge from the '90s. 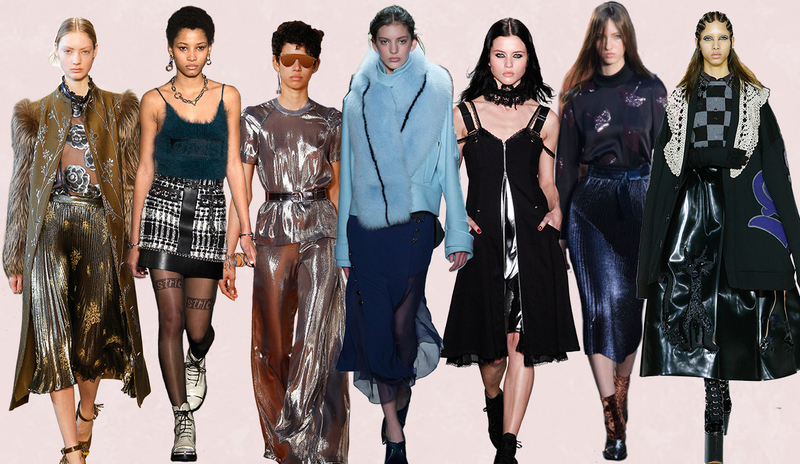 If the '90s and the edge we find in 2016 had a child, it would be this collection. 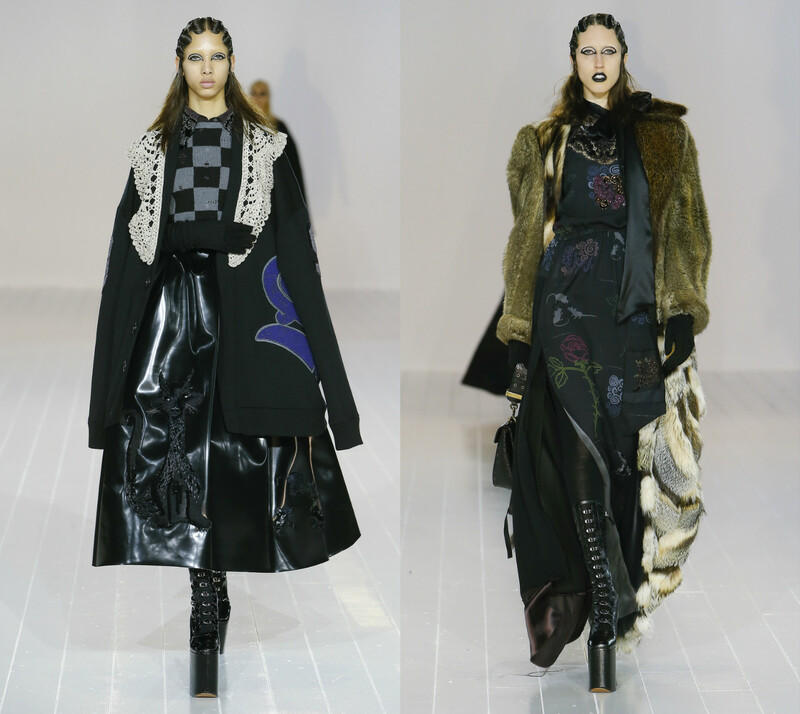 A mix of goth, even steampunk (those metal accents), and I hate to say it, but stoner-girl-chic all worked together to create an obvious statement by the designer. The weed leaf prints and repetition of the word "faded" may have turned an innovative collection into an obnoxious one, but for some reason, I was not annoyed at all. 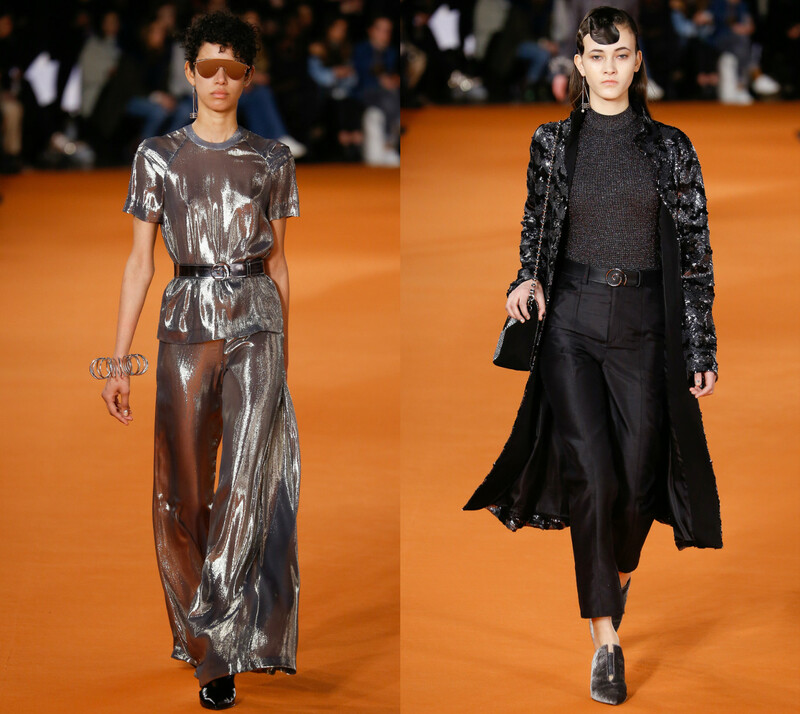 The use of black tights with either "girls" or "strict" written on both legs, the mohair tanks and sweaters, and overall boldness of the collection turned a cliché into a brilliant show. 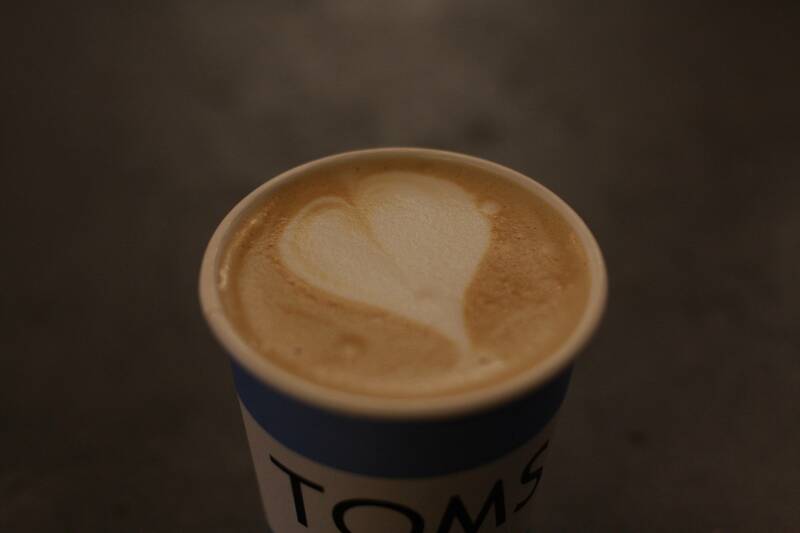 And maybe that's the point -- to make a statement. 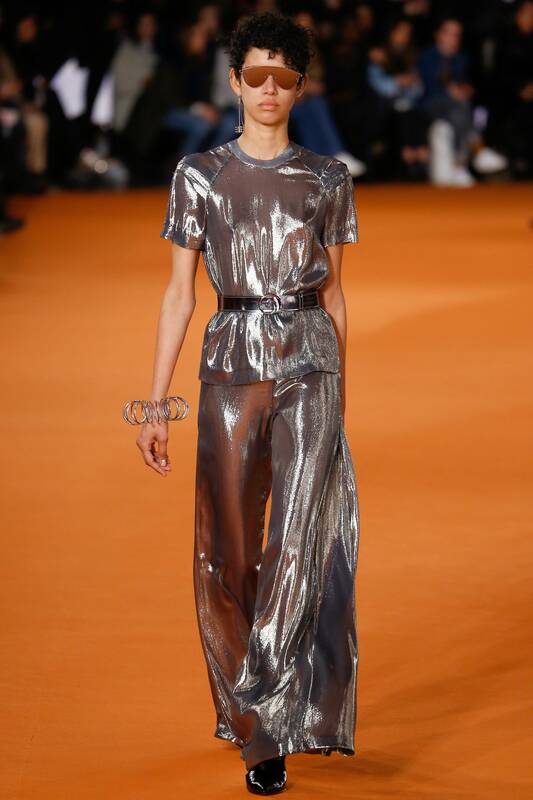 Wang booked a church for such an unholy collection -- sheer tops (not the angelic kind), drug references, and even stripper (pole included) icons on Ralph Lauren-esque pants only scream irony. Fashion is always more than the clothes, right? 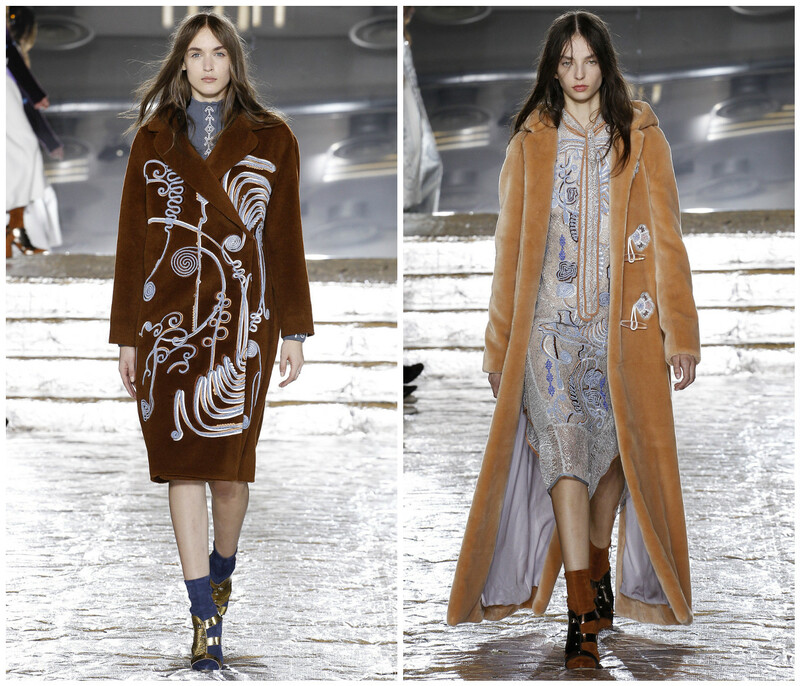 Also, I need those statement minis and denim-fur coats in my life, ASAP. 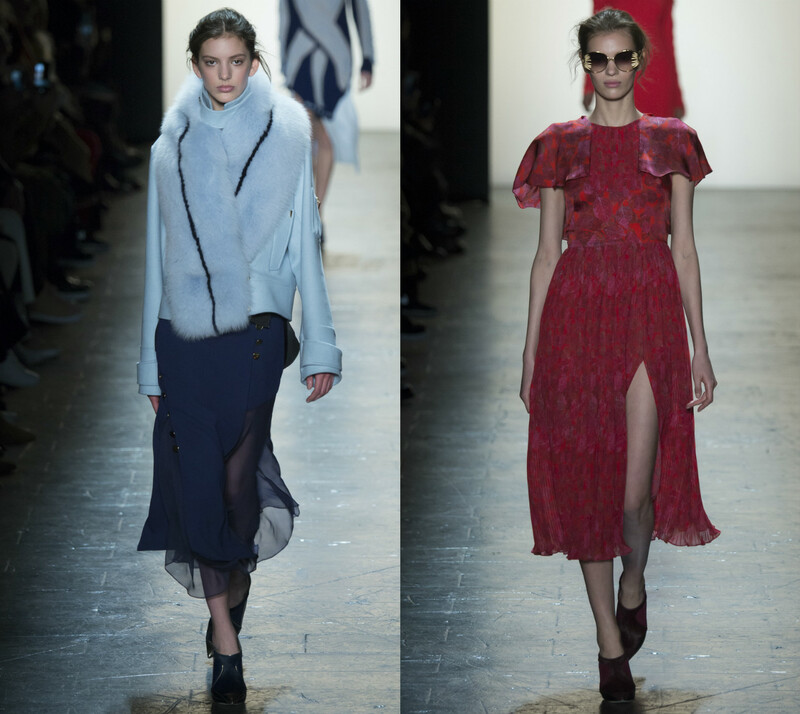 This is Alexander Wang's collection not on drugs, better known as Adam Selman's. 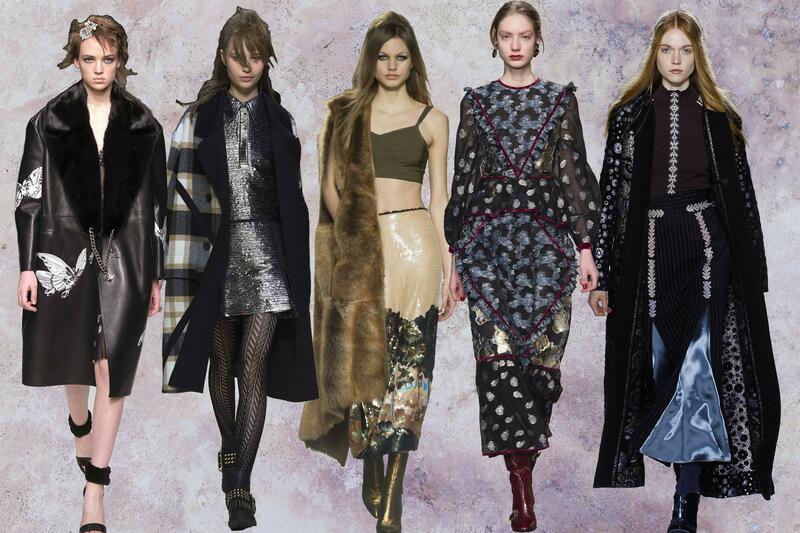 It included '90s grunge, similar to Wang's, but it has a darker, also more feminine side. Kind of like those housewives who killed their husbands (Chicago, right? ), but instead of wearing '20s-esque fishnets and frilly dresses, they wear lace chokers and the signature Avril Lavigne eyeliner. The designer brought floor-length (yet still revealing) dresses, puffy outerwear, and shiny details with a simple color scheme of black, red, silver, navy, and more black. 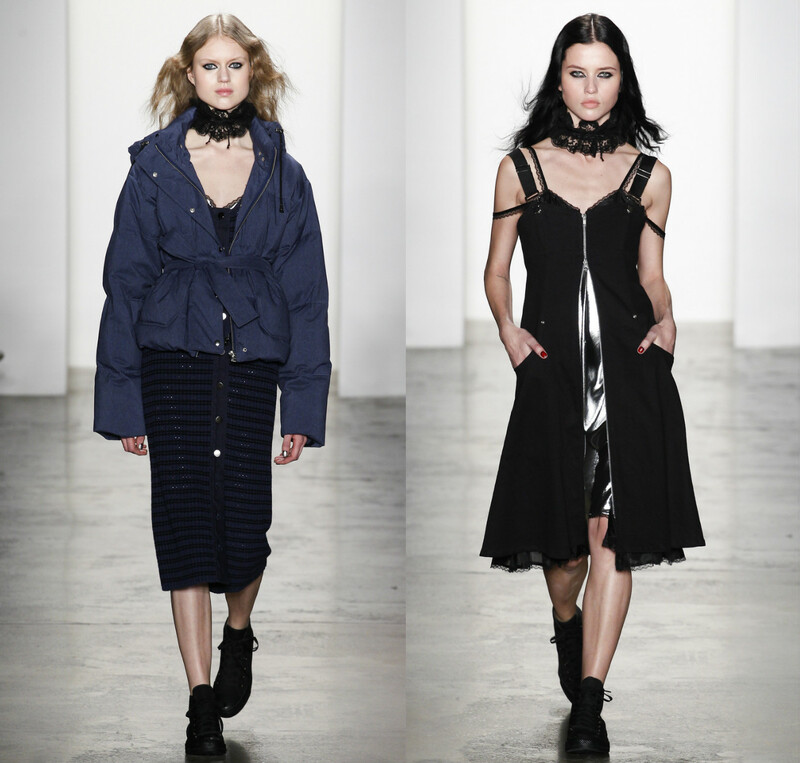 Selman obviously thinks black is the new black, and he even simplified the collection with all-black Converse, circa your punk phase in 9th grade. The over-the-shoulder straps and confetti-like details on a few pieces bring this uniqueness to a potentially overplayed style, so Adam Selman definitely won for day one of NYFW. And for the finale of my post, I give you the actual NYFW finale (how fitting) -- Marc Jacobs. I had to do a project on our potential careers three years ago and we had to pick someone from the profession, and I chose Marc Jacobs, and since then, I title him my first favorite designer. I did so much research on him, I even had to connect his designs to the media, like music, culture, etcetera, so I know exactly how he works. And based off of this knowledge, this collection embodies who he is as a designer. 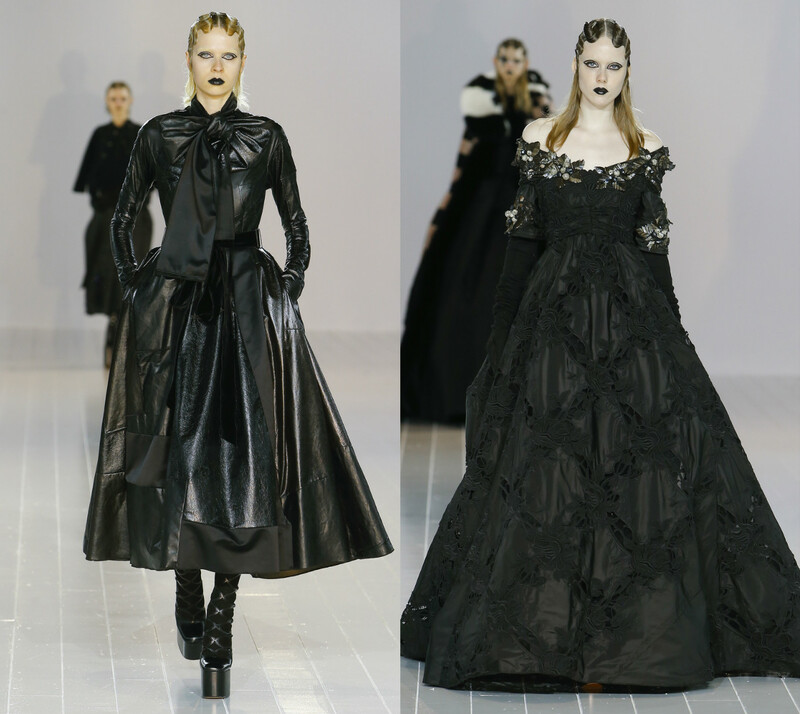 He created avant-garde pieces with a throwback to the 19th century and the British goth era of the '80s with a touch of horror and massive platform heels. Something I would never expect in fashion, but would always expect from the Marc Jacobs himself. A revival of Dracula. A Spike-Drusilla centric Buffy episode that takes place a century earlier than usual. 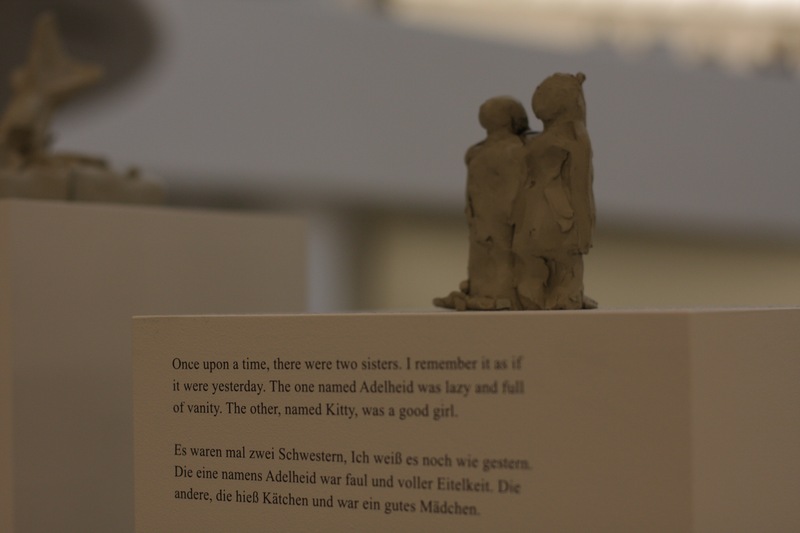 The Grimm version of Alice in Wonderland. A literal scene from a Poe story, excluding the creepy black cat or dead person under the floor boards. Jacobs won fashion week with this collection by including draping capes, full ankle-length skirts, and massive bows (Gucci SS16, anyone?). 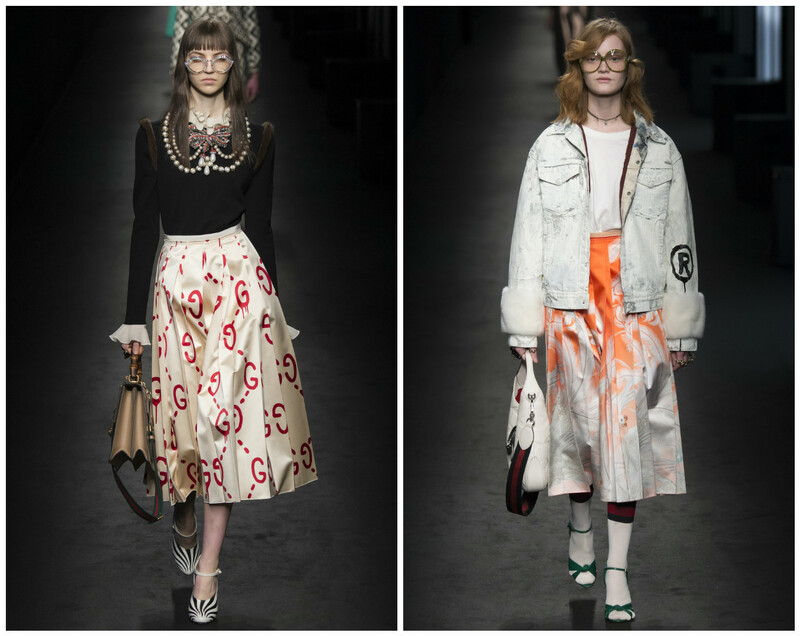 Speaking of Gucci, this show, including a huge, blank white room and an eerie repetition of dinging bells (with a mix of silence) gave me chills just like Gucci's show last season, including a snake-printed floor and ethereal French whispers that carried the angelic models across the runway. While Gucci's was angelic, Jacobs' was not necessarily demonic, but it was definitely dark, even scary (the makeup artists definitely did their jobs well). After reading multiple reviews on the show, there has been a unanimous opinion: that Jacobs ended a lacking-in-risks week on a refreshing note. Fashion is about risks, and the designer finally showed us what he thinks it's about -- that too much is just not enough. All photos from Vogue, except for Phillip Lim's, which are from Elle. Feel free to share what your favorite shows from NYFW were, and also how you felt about the shows I reviewed. 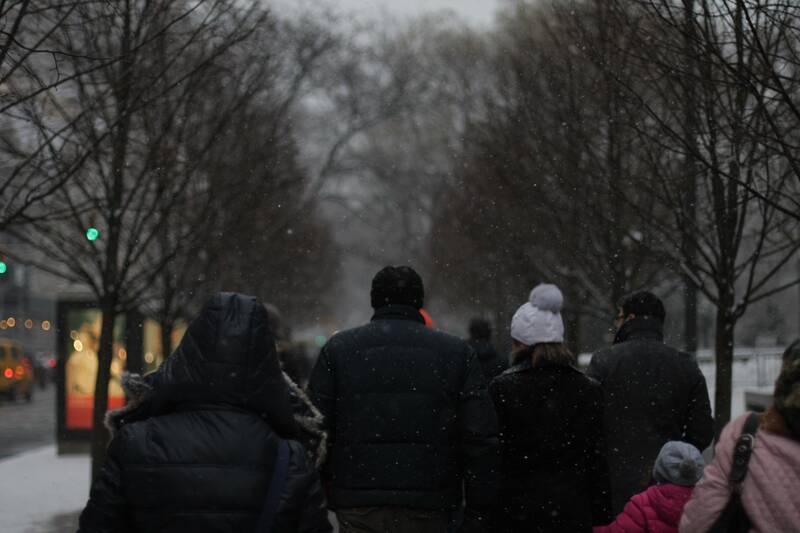 I am obviously a writer, but I'm also a photographer -- how else would my photos on here be shot? 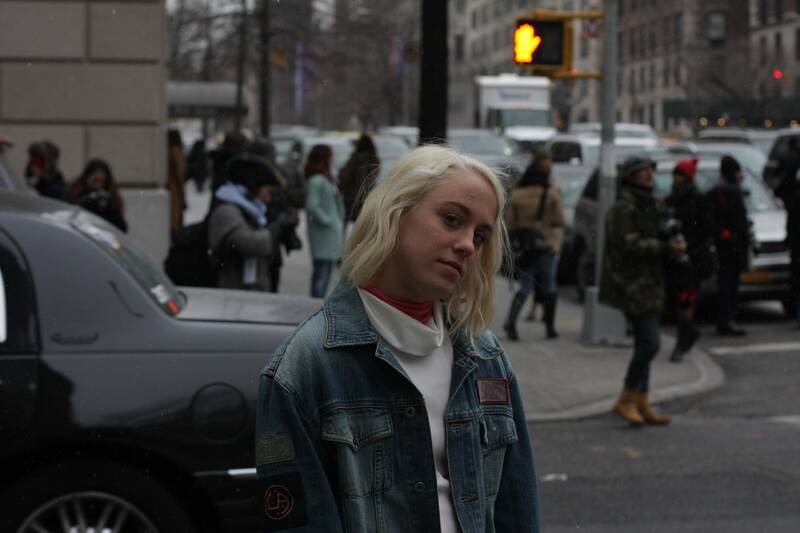 So I used both skills to create the ultimate (and oh-so typical) post: NYFW street style, including my own photos, unlike this one or this one. 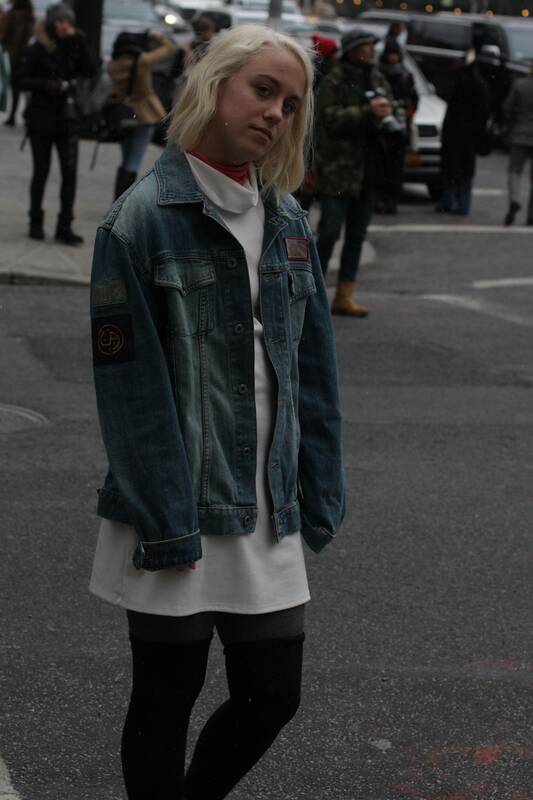 Now I feel like a non-poser, a real street style photographer! Except I didn't have a lens the size of my head (even though my 50 mm lens is deceivingly wonderful) or I didn't force some clueless guy from Vancouver to move because he was in my shot, and yes, that last part actually happened (poor dude). I was nervous at first to take street style photos because I thought you actually had to ask the street-style stars during fashion week (in other times of the year, it's a must), but during FW, all you have to do is gravitate towards all the other photographers and shoot a hundred photos of the same person, hoping that at least one of them doesn't have a random photo-bomber or a huge lens in the corner of the shot. I wished I was on the other side of the camera, but I was lacking that it-accessory or those unique shoes with gold heels or, sadly, confidence. These two girls were killing it with their coordinated outfits (twin goals!! er, BFF goals??). 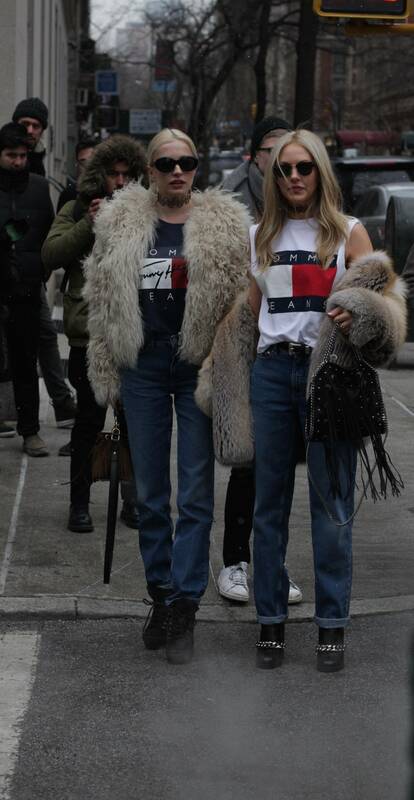 Both blonde, both have old-fashioned Tommy shirts on, both wearing short fur coats (that I really want) and straight-leg dark wash jeans, and both look flawlessly cool. The ultimate takeaway is if you coordinate with your BFF, you'll double the cool-factor, it's inevitable (have you seen the Olsen twins lately?). More BFF goals, but this time they're just really-well dressed, with only their jeans matching. Unfortunately for the girl with the huge scarf-blanket-thing, the other is the one who got the photographer to force the Vancouver-guy to move over because she's the star (I heard her saying "They love me!" multiple times). Maybe it's those boots (those gold heels are so dreamy) or the fur sleeves on her coat, but I noticed one thing -- she's staying in-style and warm, which many fail to do. All I can say about this one: I need a blue (or any other vibrant color), shaggy fur coat in my life. Also, she just got handed a Cosmo sign to hold for one of their photographers, so she must be dressed well. This look has to be my favorite, plus I also feel really creepy because I just found her on Instagram (@alexcloset) while I was scrolling through the explore page, and I had no idea who she was until I saw her face and it was kind of weird but kind of cool... Anyways, she knows how to rock track-pants, a black turtleneck, an oversized (and vintage?) Adidas bomber with silver-toed stilettos, how is that even possible? We'll call her... the sophisticated athlete. Also, I really really need that bomber, or something like it. I searched last night for hours and failed miserably. I guess she thought it'd be cool to pose right next to a steaming manhole, so photographers continued to swarm around her (including me) because this is so NYC. 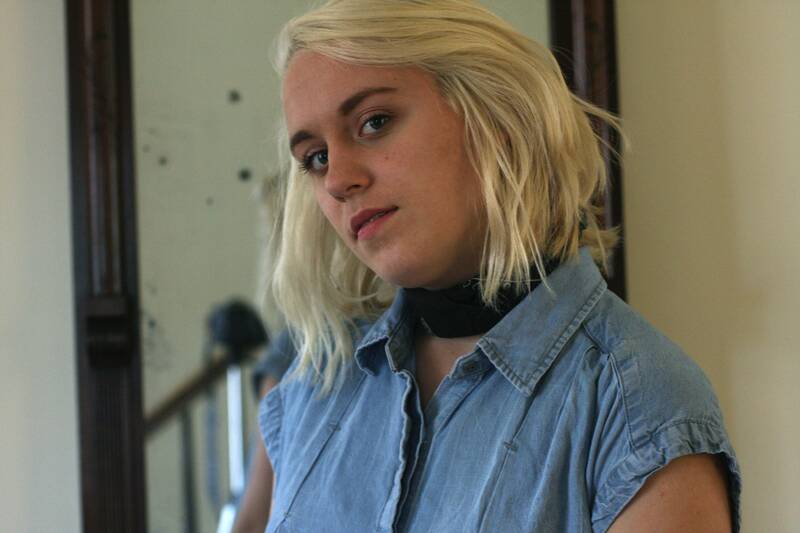 I also found her on Instagram (@asos_alice) by scrolling through my feed and seeing the exact same moment, then I realized shortly after that I had been following her for a month or so and I didn't know what her face looked like until now (this might be even weirder than the above situation). She's the only one who looks really cold (her sleeves are rolled up in 20 degrees...), but she knows how to work the knee-high heeled boots and slitted maxi. Who knew you could wear a cotton maxi in the winter? Does anyone realize that I titled this based off of how Birdman or (The Unexpected Virtue of Ignorance) (also my favorite movie) is titled? Anyways, I'm riding in the backseat of the car that is directing towards my house in the location that's the opposite of the place I've been for nearly six days, and I wonder, did I do NYC right? Like when I went down to ATL and thought that exact same thought, but the two cities are so different. Then I realized shortly after that NYC is the place I want to live in six months (hopefully), so if I genuinely acted the way I have always wanted to act, I should be doing NYC right. Right? Let's rewind a bit to see if I am correct (even though, at the end of the day, there is no right or wrong way to do a city, which is also my closing statement in the ATL post). Put on as many layers as possible, but in an innovative French way, which you saw in my last post... check. 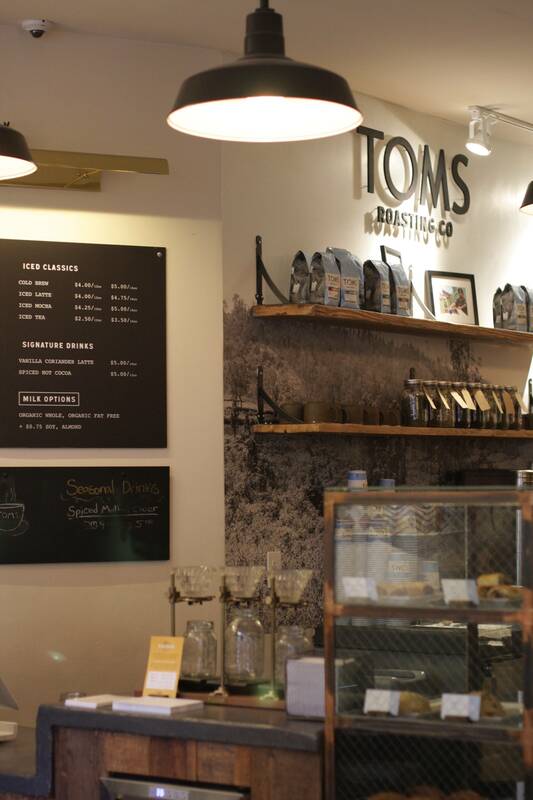 Walk around Nolita and NoHo right near Washington Square Park in said outfit to authentic coffee shops before your scheduled food tour (those exist? 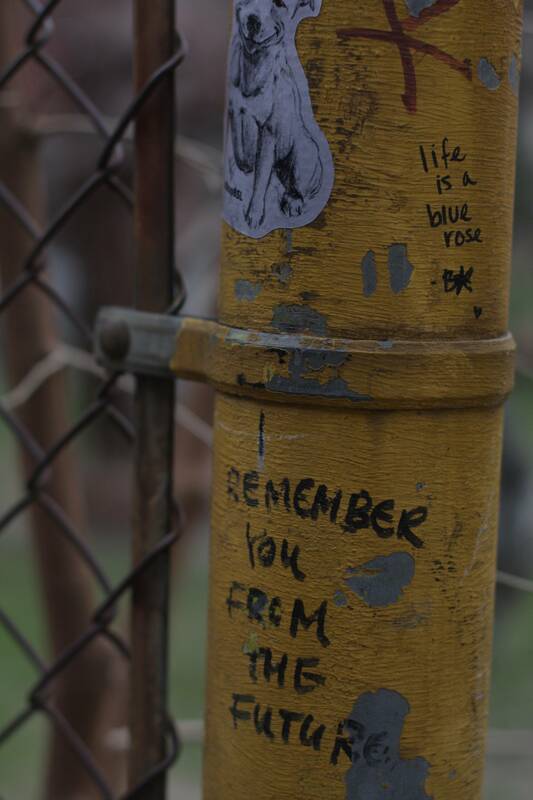 ), and also take photos of your deliciously cute (and small) cappuccino and inspirational quotes on poles. Check. Wake up the next morning to find the low is literally three degrees, no joke there, so put on even more layers than yesterday's outfit. 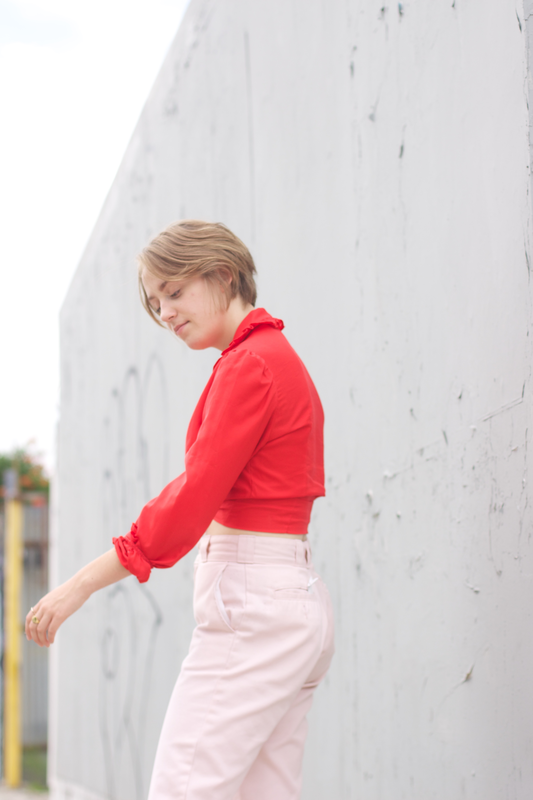 Like, a hot pink turtleneck to warm up that frozen hell outside, a sheer shirt/dress-type-piece to add a flowy-sillouhette and a collar because why not, a thick black sweater because cold, then some boyfriend jeans because skinnies won't fit over the hidden knit tights worn under the jeans. Turtleneck by J. Crew. Collared shirt by Urban Outfitters. Sweater by Madewell. Jeans by Gap. Shoes by Adidas. 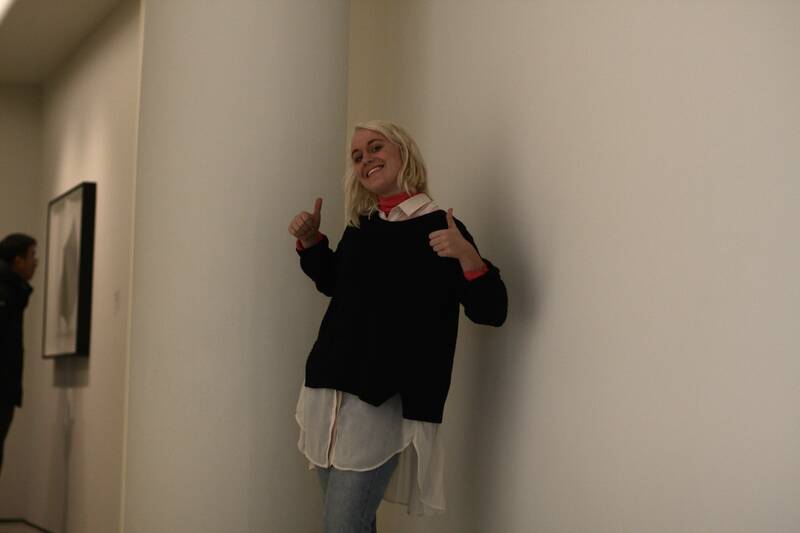 Continue to showcase layer-centric outfit inside Guggenheim Museum because I looked like a black life-size marshmallow outside. Also, add some socks that only feature Ryan Gosling's face because knowing his face is on my feet immediately adds instant warmth. 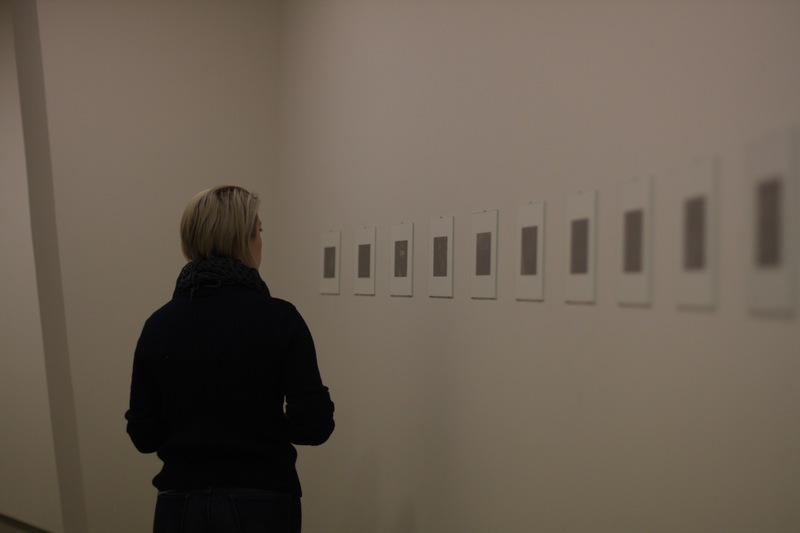 Then take, like, a billion photos at the Guggenheim but only post a few of the best ones that also happen to be the most unknown pieces, is that why they're the favorites? In the middle of everything, constantly refresh Twitter/Instagram/Snapchat for NYFW updates, and also cry because so close, yet so far. And then eat at the best Thai restaurant in the Upper East Side (called The Nuaa) no earlier than 9 p.m. and walk back to the hotel looking like the same life-size marshmallow as before, but even larger because the weather officially dropped to three. Check. Wake up thinking that the frozen hell is over, but find out that it's actually colder than the day before, and cry while layering on even more layers -- a corduroy Topshop dress over a white Asos turtleneck, another wider (and thicker) turtleneck over all of that, and then like two pairs of tights and three pairs of socks. And that's just the indoors part. Continue to not take any photos of this outfit because I was too cold and grumpy to take off my coat/hat/scarf. Eliminate that cold/grumpy mood by seeing Hamilton later that day, get trampled by crazy Hamilton fans in Times Square prior to the show, but get emotional with those same fans during the show. A nice bonding moment. Check. Wake up to happily see snow and a high of above freezing, and through happy tears, put my last outfit for NY together, which happened to be my worst, but it also included two turtlenecks (including my hot pink one from Saturday) like the outfit the day before so it can't be too bad. Turtleneck by J. Crew. Dress by Asos. Jacket by Juicy Couture. While walking to the Met, accidentally run into NYFW (the two locations just make things confusing for me) and not really realize it until everyone around me is either impeccably dressed or has a huge zoom lens on their camera. Then have a two-minute long freakout session because it's NYFW!! The dream!! then force my sister to take photos of me because street style then sigh because I would exchange this denim jacket for a fur one and these chelsea boots for Dior-esque heeled-booties and maybe, just maybe that would get me recognized by street style photographers. Then take some photos of the scene (more up-close and detailed ones will be featured on the blog in a few days), and also cram your way through pushy photographers just to get the perfect shot of the best street style, because I can be a fashion writer and a fashion photographer at the same time, right? Finally leave the scene to go to the Met because it got colder and everyone left for the Tommy Hilfiger show, then continue to get lost in the Met because it's a literal maze of art. Walk outside after 2-3ish hours of art to see a winter wonderland and get this giddy feeling because it's my first snow in the city!! And also wonder how those two girls at NYFW who were wearing pumps and no socks are doing. Check. And that's it! Well, all the important/maybe-not-so-important-but-cool parts. 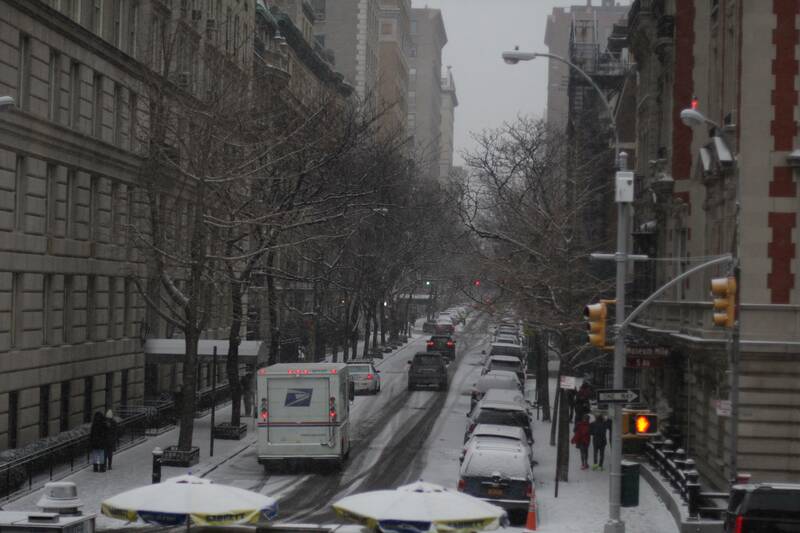 That's NYC for you, at least four days of it, and I think I did it right, layers and activities included. My ideal version would be to spend all four (preferably seven) days running around to see all the fashion week shows, but ideal is rarely the reality. See me at the shows in five years, I promise. All photos shot by me, except the ones featuring me, which were taken by Kendall.